What’s the difference between HUAWEI B593s-22 and B593u-12? Here now, we get to know there is a new model available now for HUAWEI 4G LTE CPE Router B593, the model number is HUAWEI B593s-22, its appearance is almost same as other HUAWEI B593 sub-models, such as HUAWEI B593s-82, B593u-12, B593s-58, B593s-58b, but there is really some difference between these models. From the above image, we could see that HUAWEI B593s-22 supports more 4G LTE bands, not only support FDD Band 800/900/1800/2100/2600MHz, but also TDD 2600MHz, while B593u-12 supports only FDD bands. Secondly, the downlink speed of HUAWEI B593s-22 could reach up to 150Mbps while B593u-12 supports 100Mbps. 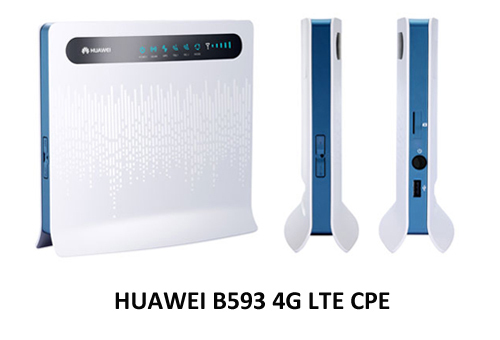 So HUAWEI B593s-22 is actually a LTE Category 4 CPE Router, like HUAWEI E5172 4G LTE CPE. Thirdly, the interface in the device is different, HUAWEI B593s-22 has only one USB interface in the device while B593u-12 has two. other features are the same. Other B593 Router sub-models have same appearance as B593u-12, just frequency bands are different. So HUAWEI B593s-22 is a 4G LTE Category 4 Router even with same appearance like B593 other models. It’s a dual-mode LTE Router for TDD/FDD modes.